This dog skeleton comes flexibly mounted on a wooden base for easy display in the classroom. The flexible mounting makes demonstration of natural canine movements possible. Every bone of Canis domesticus is included in this completer real dog skeleton. 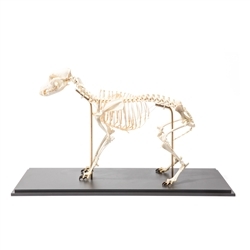 This animal skeleton can be used for comparative anatomy and other studies. Don't just teach it, show it!